I've been ignoring this one, like the proverbial elephant in the room. I mean surely the VP pick will at least be a Democrat. There has been speculation and speculation over this choice. Intrade.com is one of the offshore entities that allows you to place a wager on countless political propositions and among the popular areas for wagers is who the presumptive presidential nominees will select as their running mate. I always enjoy visiting the site because you get to see how real money is being wagered, rather than the meaningless hot air we get from the talking heads on cable television. 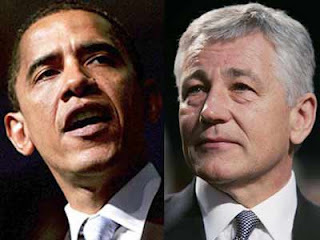 So, it struck me this afternoon when I noticed that a pretty massive wager was placed on July 20 that Barack Obama (D) will select Sen. Chuck Hagel (R-NE) as his running mate. I really hope this is not a case of someone knowing something that the rest of us don't. Senator Chuck Hagel from Nebraska has been floated for the last two months as a choice on the short list. The thinking behind this is of course since the moderate Republicans feel so disenfranchised from their party-- a respected member like Hagel would bring them in droves to our side. I, for one, am not buying it. Plus we certainly have enough talented people in our own party to choose from. It is unclear that Hagel would even deliver Nebraska, let alone some fantasy mass movement of the republicans to our side. Plus sides- Vietnam Vet with honors (Vietnamese Cross of Gallantry, Purple Heart, Army Commendation Medal, and the Combat Infantryman Badge). Won his senate seat in a land slide back in the day. Good foreign affairs creds. I did like him when he said "To question your government is not unpatriotic — to not question your government is unpatriotic." This was in reference to the lack of open debate in Congress regarding the Iraq War, and in defense of his assertion that the United States should withdraw its troops. But that doesn't mean he gets to be our VP. Can you imagine a Republican choosing a Democrat for that spot? Pretty lousy on immigration, supported the President's plans. Which I guess is better than if he supported the Brownback, Tancredo types. In addition to the VP speculation there are people who float his name for cabinet position of Secretary of Defense in the Barack Obama administration. I might be ok with that.